I firstly cut a piece of Grunge paper measuring 12"x 7". I shaped one end using an On the Edge die called Plaque and Postage. 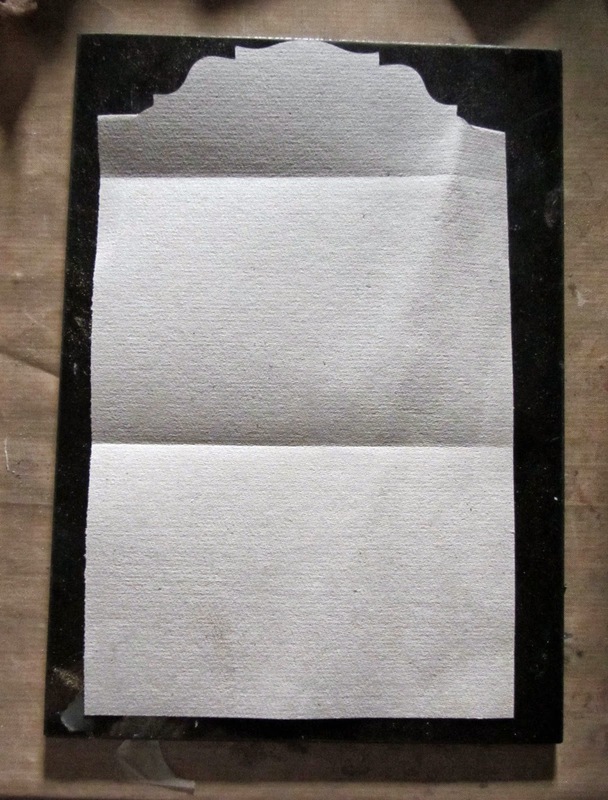 I then folded the Grunge paper into three sections as shown. I covered one side with a piece of the new Postale Tissue Paper, using Studio Gloss Multi Medium, making sure that the edges were well sealed. I also painted the Multi Medium all over the surface of the tissue. Whilst this was drying, I turned my attention to decorating the black tissue paper. I stamped over the tissue paper in sections, using Versa Mark ink. 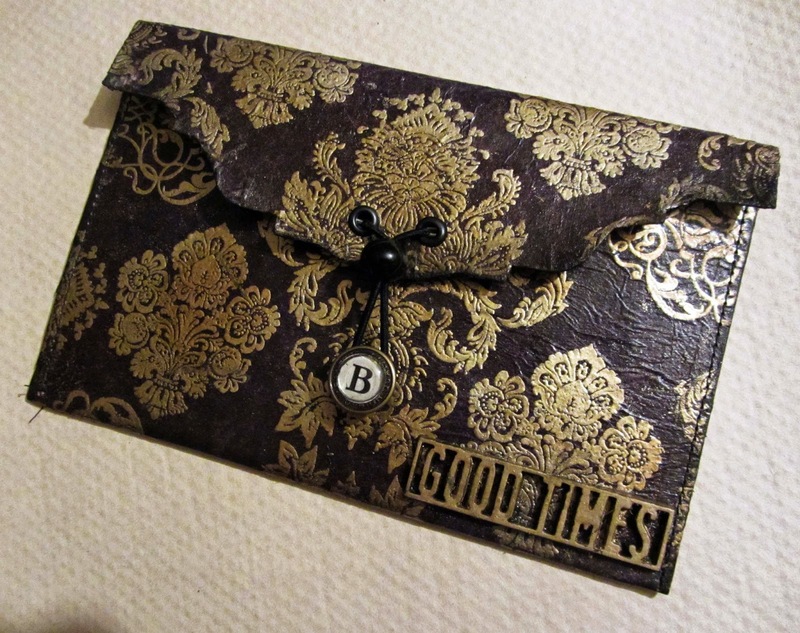 I used the simply gorgeous,Stampers Anonymous, Distress Damask stamp set. I love these stamps, they're definitely proving to be far more versatile than I ever thought they'd be! 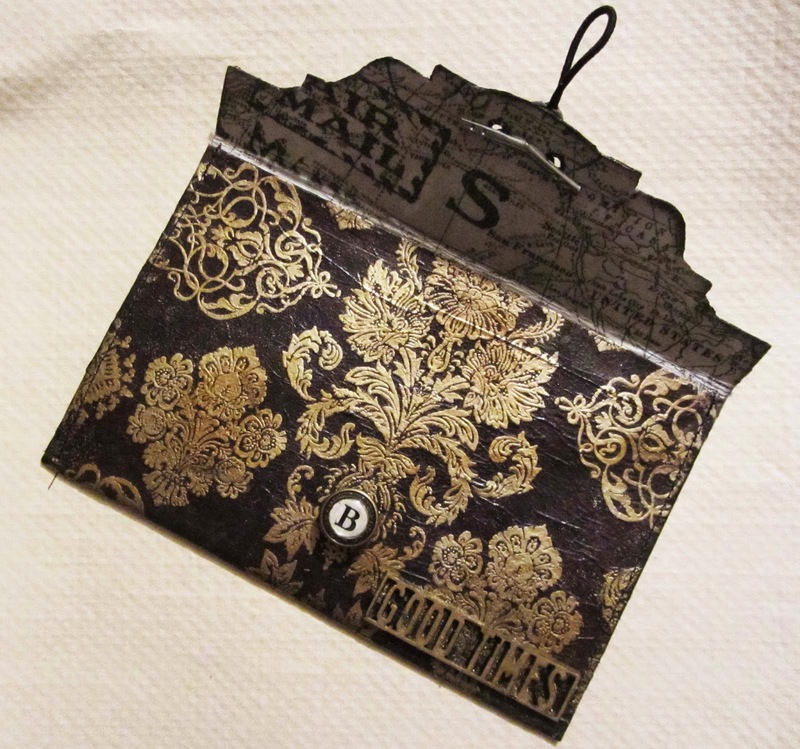 I then applied gold embossing powder and heated to activate. The gold really shines out on the black background and gives a wonderfully opulent look. I then adhered the tissue to the other side of the Grunge Paper. Once again I used a generous amount of Gloss Multi Medium on the Grunge Paper and also coated the embossed tissue paper. Once this was dry, I created a fastening by punching two holes and adding a couple of eyelets. I then threaded one of Tim's Ideaology elastic bands through. These are great little fasteners with crimped metal ends. 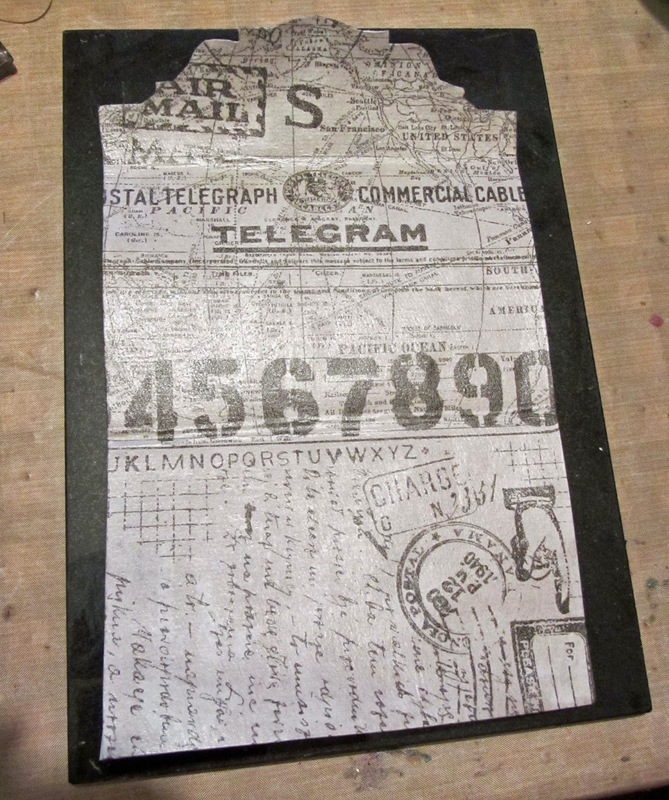 If you fancy having a go at something like this, here's a list of the supplies I've used from the fabulous eclectic Paperie shop. What a wonderful project Toni! 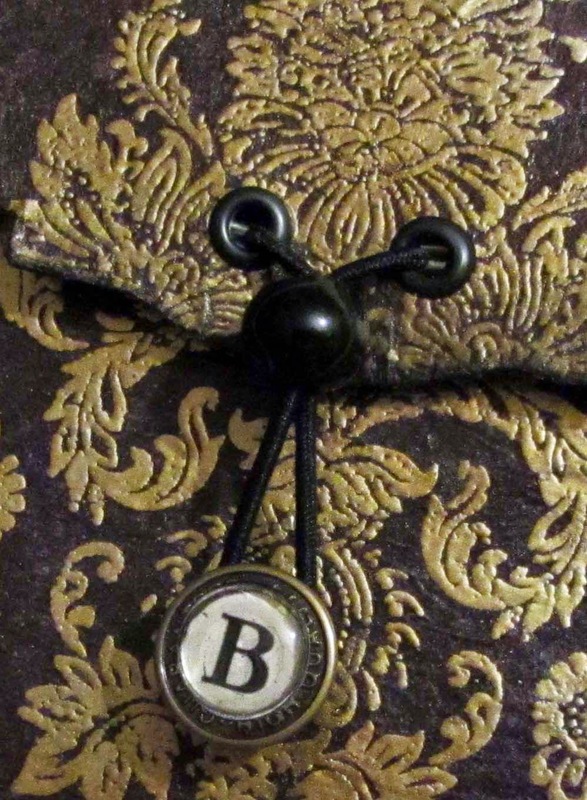 LOVE the gold embossing on the black - and your beautifully designed purse!! 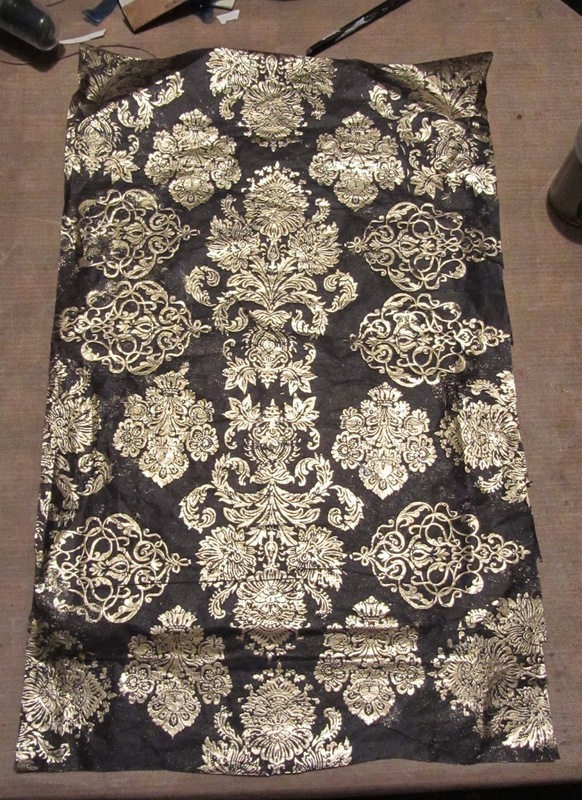 LOVE the gold damask against the black and the tissue paper on the inside! This is just FABULOUS, Toni! LOVE the shape and that fastener is just Genius! That is awesome. Just love how this turned out Toni. And the fastener!!!! Love it.